Rick and Morty isn't quite back yet, but that doesn't mean we can't enjoy the show in board game form. This officially Monopoly game takes place in the ever-expanding multiverse that the titular characters explore. 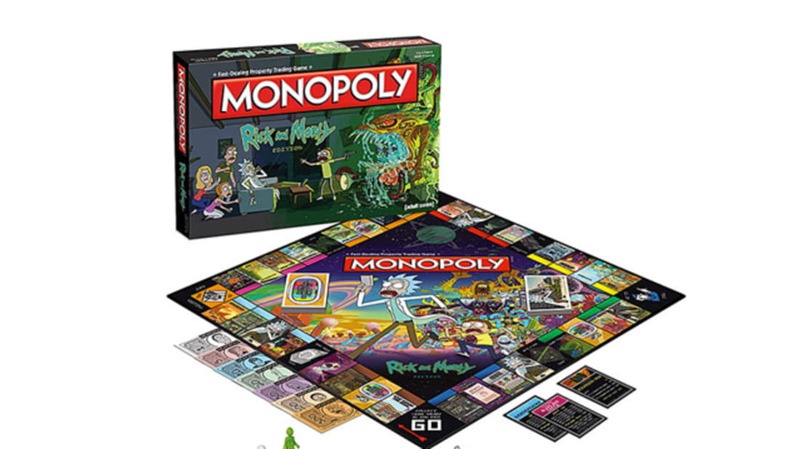 You can play with a one of six tokens based on items from the game: a Meeseeks box, Council of Rick badge, the portal gun, a plumbus, Rick's ship, and Snuffles' helmet. There are Flooble Cranks and Gooble Boxes in stead of houses and hotels, and Get Shwifty! and Interdimensional Cable TV cards instead of Chance and Community cards. The whole board is custom designed and features places from the show like Rick's garage and Blips and Chitz. If you're looking to take over the real estate market in space, you can get the board game on Amazon, no Flurbo currency needed.